This Borneo Pygmy Elephant (Elephas maximus borneensis) mother and calf were grazing along the Kinabatangan River in the state of Sabah, in Malaysian Borneo. The rainforest corridor is quite narrow along the river here and these elephants routinely push into Oil Palm plantations but on this day, the whole herd was feeding right along the river. I was accompanying researchers as they were checking their live traps when we came upon them. Even they, who spend every day on the river, where exhilarated to see them. We spent three hours watching these guys and it never got boring. I never had the chance to see them the last time I was in Borneo so getting to observe them this time was a real treat. 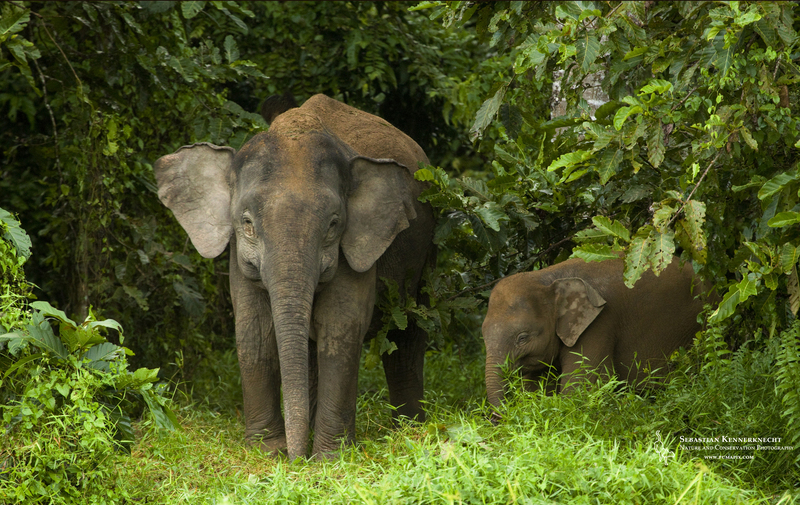 As always, just click on the image for the wallpaper sized image or use this link Borneo Pygmy Elephant Mother and Calf.